Hello! Welcome to Daydreams of Quilts! Today I would like to share with you a free tutorial to make the quilt I am calling "The Cogs and Wheels" quilt. Find out how to get a free PDF download of this tutorial at the bottom of this post. Okay, let's get started! 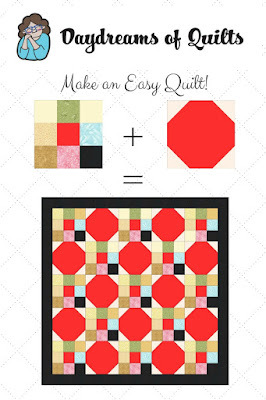 Pattern Notes: This quilt tutorial makes a 68 x 68 inch quilt. All seams are ¼”. Press as directed. Trim all charms to 4 ½”. Separate 48 light charms from the charm packs (trim to 4 ½”) and draw a diagonal line across the back. Cut 12 – 12 ½” squares from coral background fabric. Cut 13 – 4 ½” squares from coral background fabric. Cut 8 – 4 ½” by width of fabric strips from border fabric. Cut 7 – 2 ½” by width of fabric strips from binding fabric. Sew four light 4 ½” squares to the four corners of a 12 ½” background square. Sew on the drawn line, trim a ¼” from the line and press towards the corner. Tip: Save the off cuts to make a matching half-square-triangle pillow cover later on! Sew 13 nine patch blocks. Choose 8 – 4 ½” squares and one background square. Layout the nine patch with the background square in the centre. Sew the squares into three rows of three. Press seams in opposite directions. Sew the three rows together and press seams from top to bottom. Lay out the quilt top following the quilt layout diagram. Make 5 rows of 5 blocks. Press seams in opposite directions the same as we did in the nine patch blocks. Sew the 5 rows together and press from top to bottom. Sew the border strips into four sets of two pieced end to end. Attach the borders to the side of the quilt. Trim excess fabric from the ends and then attach borders to the top and bottom of the quilt. Press towards the borders. When the quilt top is finished make your backing by cutting the 4 yards in half to have two 2 yard pieces. Trim selvages off and piece the two pieces together with a long vertical seam. Press well. Make a quilt sandwich by layering the quilt top on top face up, batting in the middle and backing on the bottom face down. Pin or spray baste the quilt. Quilt as desired. Trim the edges. Sew the 7 binding strips end-to-end with biased seams. Trim ¼” from the seam and press. Fold the long binding strip in half lengthwise and press. Attach the binding to the front of the quilt with ¼” seam, fold to the back and hand sew to finish. For a free downloadable and printable copy of this tutorial with more detailed diagrams please subscribe to the Daydreams of Quilts newsletter! I free mtion quilted this quilt with circles on strings to mimic the pattern in the background fabric. I also quilted the feathers in the border.